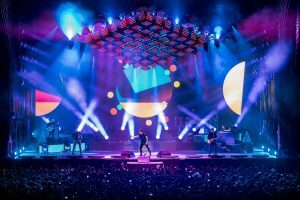 The stylish, streamlined lighting and visual design for popular chart-topping Spanish singer and musician Pablo Alborán’s current “Prometo” tour has been created by LD Chus Fernandez working closely with artistic director Salva Alborán. 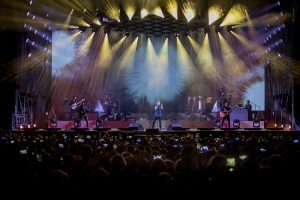 It is a fine-tuned fusion of lighting, video and automation that brings a diverse and exciting look to the show which will be on the road for at least a year on this, Alborán’s fourth studio album cycle. Chus chose to work with Robe moving lights, picking 40 x MegaPointes, 48 x Spiiders and 32 x BMFL WashBeams as the work-horses of the rig, all supplied by rental company Fluge. 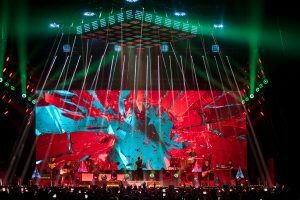 It is Chus’ second year as LD, lighting director and operator for Alborán, and he and Salva – who also creates the video content – worked out numerous multi-level ideas and looks to ensure that all the different visual elements had their chance to shine. 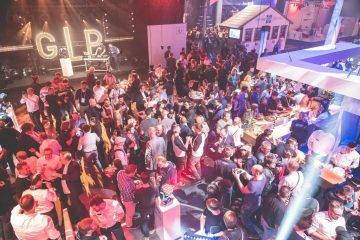 With a large upstage 4.8mm LED screen measuring 16 metres wide by 7 high and a moving ceiling of 72 x 5×5 matrix LED fixtures as a special feature, both these aspects can change the shape and architecture of the performance space. Chus therefore needed very intense and highly adaptable fixtures to create the desired lighting looks and effects. The upstage truss above the screen contains 16 x MegaPointes, and four diamond orientated trusses around the 5×5 ceiling feature are rigged with 24 x MegaPointes – six per section of truss, so both these sets of MegaPointes make powerful borders around these two set features. Thirty-six of the Spiiders are positioned on both sides of the stage in diamond shaped frames, with the other 12 Spiiders and 12 of the BMFL WashBeams on the floor, dotted around the risers and stage set. The final 20 x BMFL WashBeams are positioned round the sides of the screen. Chus explained how he is using these different Robe fixtures. The BMFL WashBeams provide “exceptionally strong” back light which can also be directed into the audience and involve them in the action, while at other times they are utilised for texturing the environment. MegaPointes have an important role due to the “sheer potency and brightness of the lightsource”, which enable some “truly great” effects on the stage. Sometimes he combines the two prisms, other times he uses the beam exclusively as a hi-impact audience blinder. They also create detailed texturing over the stage, or are used as spots marking the positions of Alborán and his band – multifunctional in every sense of the word! The Spiider is also vital to the show, and Chus uses them in wide mode so he can maximise the ring-zone effects. “Combining these different zones I get incredible colour mixes and looks, or even with just using the central flower effect, it is really an incredible feature to have at your fingertips” he enthuses, admitting that it’s probably his favourite luminaire right now! Each Robe fixture was chosen for its precision and flexibility and because “I really needed lights that can do more than one function equally well”. The show is a mix of theatrical intricacy one minute and power rock looks the next, plus everything in between, and he achieves this goal beautifully with a sensibly sized lighting rig and a Robe solution. The most important visual goal for the Prometo tour is to combine video – including the IMAG mix cut by Iván García and David Hidalgo – and lighting, so both medias are working together as an elegant and effective live treatment for the stage. 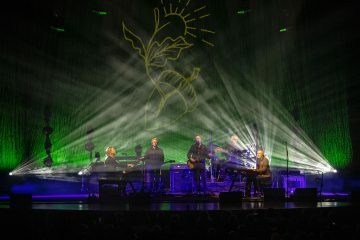 Chus also programmed the show, and for him it is fundamental to be involved in all these parts of building a lightshow – from the designing, blocking and programming, right through to the operation. During production rehearsals at Fluges Studios in Arganda del Rey, Madrid, he worked with two assistant programmers, Juan Manuel Lazaro and Javier “Rubito” Lapuerta, and on tour, Rubito is his lighting design assistant. The Fluge lighting crew chief is Bochi Piaggio. Miguel Angel Almagro is the video crew chief, Iñaki De La Vega operates the automation and Nacho Jipi is the stage manager. Keeping everything running smoothly on the road is production manager Gorka Mondragón and tour manager Ricardo Badal. Chus has been using Robe products in his work for about 7 years now. 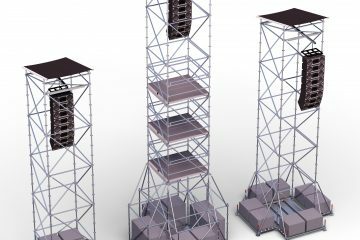 He is a freelance LD based in Madrid, working internationally, and trained as an electronics engineer, so he knows about how everything works technically as well as how to apply imagination and lighting drama to a stage. “I believe Robe is one of the most important moving light brands in the world at the moment” he states. Fluge are one of a number of rental companies in Spain who have invested in Robe in recent years via Robe Spanish distributor EES. The Prometo album debuted at Number One on the Spanish charts when it was released at the end of 2017, and the tour is currently scheduled to continue until the autumn in Spain, with Latin America possibly also on the horizon!